Freddie Burns is one of England's standout fly-halves and is challenging for the No.10 test jersey. 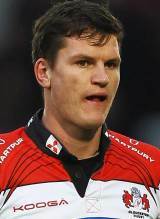 Burns joined the Gloucester Rugby Academy from local rivals Bath and first caught the eye in Andy Hazell's Testimonial game in pre-season in summer 2009. He came to prominence in the autumn of that season and quickly established himself as a solid goal kicker. After his return from surgery to cure a niggling calf problem, Freddie's progress was rewarded with a senior contract and selection for England U20s Six Nations squad. He went to Argentina in June 2010 as part of the England U20s Junior World Cup squad. He returned to make 16 starts in the Gloucester first XV in 2010-11 and became first choice for the 2011-12 season when Nick Robinson moved to Wasps. He shone on the domestic stage for Gloucester and garnered a reputation as one of the Premiership's best attacking No.10's. He was named in the England Saxons squad for the 2012-13 season but was promoted to the EPS in January 2013. This followed his impressive appearance from the bench for England during their memorable win over the All Blacks in December 2012.